Figure 1. 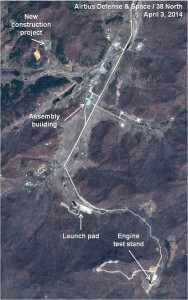 Construction underway at the Sohae Satellite Launching Station. For all images, click to enlarge. Image © 2014 Airbus Defense and Space. All rights reserved. This image is not licensed for media usage. 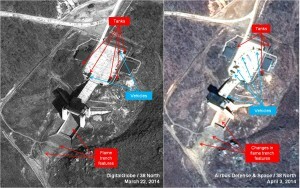 Recent commercial satellite imagery indicates that North Korea has conducted one or possibly more tests of what appears to be the first stage of the KN-08 road-mobile intercontinental ballistic missile during a two-week period from March 22 to April 3, 2014. This conclusion is based on the following observations. 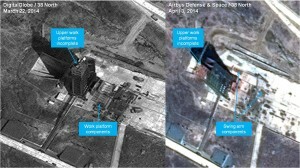 Activity at Missile Assembly Building: Imagery from March 22 shows a probable KN-08 first stage and its prime mover, a second stage and its prime mover, two white vans and a crane parked inside the fenced enclosure of the assembly building. 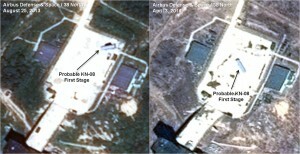 These rocket stages had either been delivered to Sohae by train or have been in storage at the facility (figure2). 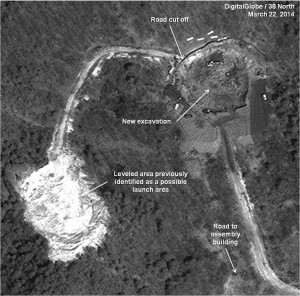 When this area was seen again on April 3, the first stage had been moved to the test area and only its prime mover and an unidentified truck were present. Figure 2. 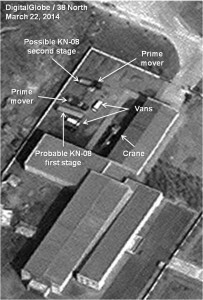 Probable KN-08 stages and vehicles prior to movement to the test stand. Figure 3. Tests of probable KN-08 first stage engines in late August 2013 and late March/early April 2014. Images © 2013, 2014 Airbus Defense and Space. All rights reserved. These images are not licensed for media usage. Fuel tanks appear in different locations indicating that the unloading of fuel and oxidizers that precedes a test has taken place. Before a test, fuel and oxidizers are delivered to the stand in tanks and then pumped into larger tanks that are enclosed by the buildings on each side of the pad. When that process is complete, the empty tanks are stored off the pad and picked up for shipment to a chemical plant to be refilled. Stepped up vehicle activity on the pad is likely the result of a test in progress. Not only are fuel and oxidizer tanks delivered by truck and then removed, but the personnel who conduct these tests are transported to the pad. Vehicles also bring in the optical instrumentation needed to document the test and security vehicles close off the pad beforehand. Differences inside the flame trench and on the ground just outside it are consistent with the conduct of an engine test. Inside the trench there appear to be differences in the texture of the material. Just outside the mouth, white paths or trenches to instrumentation positions have been partially covered by dirt, probably from the blast (figure 4). Figure 4. Before and after photos of possible engine test. Image left © DigitalGlobe, Inc. All rights reserved. For media licensing options, please contact [email protected] Image right © 2014 Airbus Space and Defense. All rights reserved. This image is not licensed for media usage. Construction of the upper platforms on the gantry used to launch the Unha SLV continues, as does work on the new bridge to the pad necessary to handle larger new launch vehicles. The swivel work platforms have not yet been put on the tower and as of April 3, are still being assembled on the launch pad. Since construction is still not complete, an SLV launch from this facility is unlikely, probably until early summer (figure 5). Figure 5. Ongoing construction at the launch pad. Image left © 2014 DigitalGlobe, Inc. All rights reserved. For media licensing options, please contact [email protected] Image right © 2014 Airbus Space and Defense. All rights reserved. This image is not licensed for media usage. 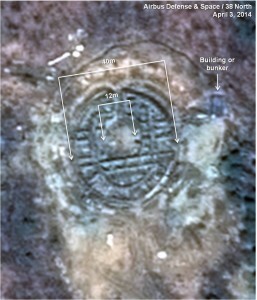 Imagery has identified new construction of an unusual structure on the top of a hill to the north of the assembly building and about 200 meters northeast of a ground clearing seen in earlier imagery. Activity began after March 6 and major excavation was observed two weeks later. By April 3, the foundations for a circular structure—about 40 meters in diameter with many interior walls—had been formed but not yet completed. Near the center is a twelve-meter walled circular opening that is not yet filled in. One possibility is that this area is a flame trench with an opening on the north side of the structure (figures 5 and 6). Figure 6. New construction spotted in late March. Figure 7. New unidentified structure being built. Image © 2014 Airbus Defense and Space. All rights reserved. This image is not licensed for media usage. Measurements of the lengths of first and second stages seen near the assembly building are about 10 meters and 4.5 meters respectively, and both are about 2 meters in diameter. These compare favorably with the measurements of the KN-08 missiles shown in the 2012 and 2013 parades in Pyongyang that were 9.2 meters and 4.5 meters with diameters of about 2 meters as well as stages previously spotted at the Sohae engine test stand. It is also possible that the observed rocket engine could be the second or third or stage of a new large SLV under development.